Amanda Seeto has worked as a pharmacist for the last 18 years. When she started the sign up process for My Health Record in December 2017, it didn’t take long for her to get online and see the benefits in her daily practice. My Health Record equips pharmacists with information such as hospital discharge summaries to assist during transition of care when medication errors are most likely to occur. For Amanda, this made things a lot easier when she didn’t receive a discharge summary through her “trusty, old fax machine”. She says that having access to additional information gave more context to the changes. My Health Record assists Amanda to tailor advice to patients based on the health information she can now access. The My Health Record system also includes a section for allergies and adverse reactions, providing pharmacists with a more complete picture of their patients’ health. 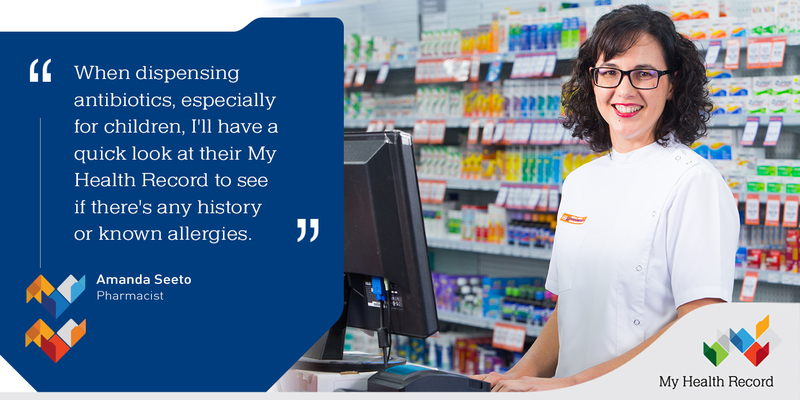 Amanda believes that pharmacy is a “very important contributor to My Health Record”.